Where did the Universe come from? How did it start? What were things like way back when? Will the Universe end and if so, how? And when? Contemplating such questions is a realm of study called cosmology. Getting at answers can take us to the very largest realms of the Universe—galaxies and arrangements of galaxies—and to the very smallest realms of the Universe—subatomic particles. Viewing the largest realms of the Universe requires really good telescopes, since the farther away objects are, the dimmer they appear. In chapter four, we found out about distance finding by observation of brightness of Cepheid variable stars. Distances to nearby galaxies can be found by observing Cepheid variable stars and other types of variable stars in those galaxies. The Cepheid variables that Henrietta Leavitt studied were all about the same distance away, in a nearby galaxy—the Small Magellanic Cloud—about 160,000 light-years away from us. Though the Magellanic Clouds are nearby in relation to other galaxies, they are extremely far away compared to the stars in our immediate neighborhood. To say that all the stars in one of the Magellanic Clouds are roughly the same distance away from us is somewhat like saying that all the people in New York are about the same distance away from Los Angeles. To find distances to the most distant galaxies, Cepheid variable stars are of no use, since we cannot see individual stars in galaxies that far away. For great distances we use “standard galaxies.” Studies of Cepheid variables in nearby galaxies have shown that certain types of galaxies have fairly predictable absolute brightnesses. We assume that those same types of galaxies have the same absolute brightness no matter how far away we find them. 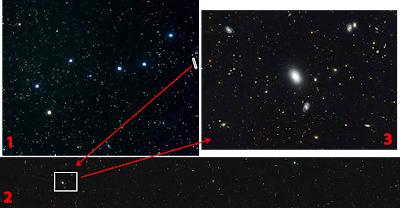 Then, just as we did with the Cepheid variable technique, we can figure out how far away the galaxy is by measuring its apparent brightness. (3) Mosaic of more than 500 images near the handle of the Big Dipper taken with NASA’s Hubble Space Telescopes reveal at least 50,000 galaxies yielding clues about the Universe’s youth, from its “preteen” years to young adulthood. Yet another way to tell what’s happening at great distances from us is to look carefully at the spectra of distant objects. It’s helpful first to recall what happens when you hear a train or fast moving car first come towards you and then go away after it passes by. You hear a distinct change of pitch—higher pitch as the train or car approaches you, and lower pitch as the train or car is going away. The sound waves are vibrations of air molecules. The pitch of the sound is related to basic properties of the sound waves: wavelength (length of each sound wave) and frequency (how “frequently” the sound is vibrating). The higher pitch waves are higher frequency and shorter wavelength than the lower pitch waves. 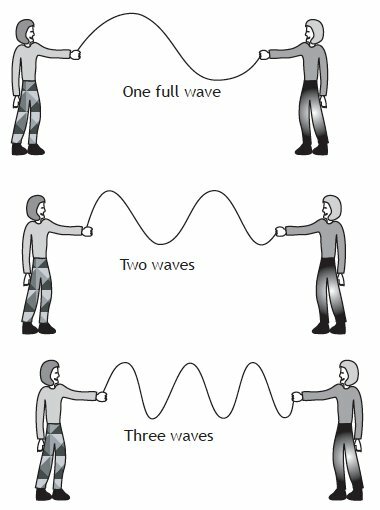 Light waves can exhibit Doppler effect as well, only higher frequency (shorter) waves are not higher pitch sound but instead colors towards the bluer end of the spectrum, and lower frequency (longer) waves are towards the red end of the spectrum. Light also can be described as particles called photons, each with a set amount of energy. Photons of red light are lower energy, corresponding to lower frequency waves, while photons of blue light are higher energy. When we talk about how big the Universe is, we start speaking in light-years, which, though not a measurement of time, certainly reminds us of time. When we look at a galaxy a hundred million light-years away from us, we must realize that the light that reaches us from that galaxy has been traveling for a hundred million years. We are looking out into space and back in time as well. It makes you wonder about the age of our Universe. One of the main objectives of the Hubble Space Telescope is to see farther into the Universe than ever before. The farthest galaxies detected are several billion light-years away. That’s extremely old light. The overall movement of distant galaxies leads us to the idea that if we imagine backtracking in time, the Universe may have started as a sort of fireball of unimaginably dense energy. Such an event is often called the Big Bang. The age of the Universe can be estimated by backtracking in a cosmological model based on the Hubble constant. As of 2007, the best estimate of age is 13.7 billion years (+/- 0.2 Gyr). There are other independent ways of estimating the age of the Universe, for example the age of the chemical elements, the age of the oldest star clusters, and the age of the oldest white dwarf stars. There are many mysteries in modern cosmology. A discovery that the rate of expansion of the Universe is increasing led to problems with previous cosmology models and is leading to the idea that there is some sort of unknown form of energy causing the “anti-gravity” force that is pushing everything in the Universe away from every other part of the Universe. That unknown form of energy is referred to as dark energy. Way before the discovery of increasing rate of expansion of the Universe, odd behavior in the spinning of galaxies led observers to conclude that there must be some additional matter in those galaxies that would explain the odd behavior. In fact, we were shocked to realize that there must be way more unseen matter in the Universe than matter that we can see. Considering matter and energy together, and referring to both as energy, only about 4% of the total energy in the Universe can be seen directly. About 22% is very likely of dark matter. and the remaining 74% is likely dark energy. We do not know much about either dark matter or dark energy. But we see their effects. The myriad of galaxies in the Hubble panorama images at the beginning of this chapter does not appear evenly spread out. Some galaxies seem to be grouped together. Others are scattered through space. This uneven distribution of galaxies traces the concentration of dark matter, in an apparently invisible web-like structure stretching throughout space. Galaxies form in areas rich in dark matter. And students of astronomy form in areas rich in cosmic mysteries. can be found on their YouTube channel. You can also listen to audio-only podcasts.